One for the oldtimers! I remember my grandfather and his friends always moaning about the brook that was filled in when the Farm was built in the 50/60s. Please envisage a blank canvas!!!! From what I recall it went from redhill/callow, grosmont grove, top of Brampton rd, kilpeck, muir, Sherborne, millard, and into the brook on waterfield, on a kind of diagonal tangent! My grandfathers friends gardens were always wet in the height of summer! My childhood house always has a damp back room, "condensation" sunken patio and a wet garden. Yet the neighbours didn't! This was also still the case a few years ago!! 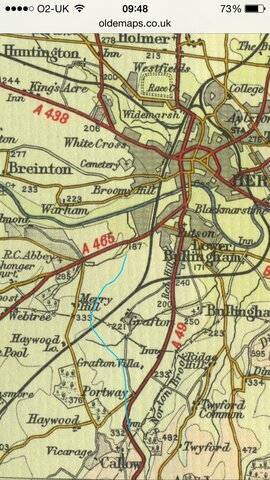 The route is approximate, as you may see, a few brooks are drawn on there; and they didn't have aerial photography back then! !